Based on the already well known plant biostimulant RR SoyBooster ®, Axter Agroscience has developed RR SoyBooster® 2.0, a biostimulant with even better performance. 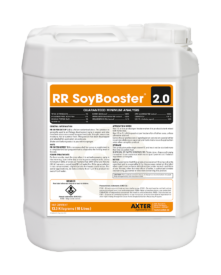 RR SoyBooster® 2.0, by the addition of nutrients and organic acids, will help the plant overcome stress, such as those caused by glyphosate application, more quickly and more consistently. RR SoyBooster® 2.0 was designed specifically for glyphosate resistant soybeans sprayed with glyphosate only (no other herbicide in the tank mix).